A coalition of environmental and citizens groups rallied on Thursday in front of a State Senate hearing in Stuart, Florida saying government must act now to stop the devastating toxic algae outbreaks that are making people sick, and killing hundreds of manatees, dolphins and birds in the Indian River Lagoon and the Caloosahatchee River. 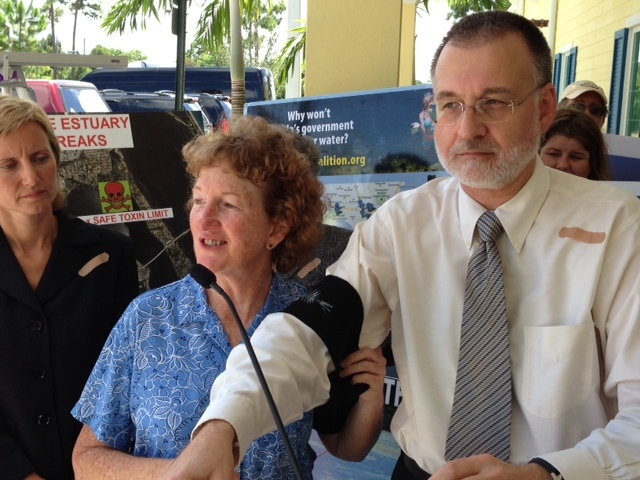 The event preceded an eight-hour Select State Senate Committee meeting headed by Senator Joe Negron to come up with solutions to end the environmental crisis that has occurred as hundreds of billions of gallons of polluted fresh water are released from Lake Okeechobee through the St. Lucie and Caloosahatchee Rivers to the coastal estuaries. The groups called Governor Rick Scott’s announcement this week to propose $40 million to fund a regional water storage project a “Band-Aid” that does not store and clean up enough water to the Everglades and fails to regulate the bulk of the damaging pollution from sewage, manure and fertilizer runoff. Hundreds of residents attended the meeting, which featured panels of scientists, agricultural representatives, government officials and environmental advocates. Leaders of the Sierra Club, Florida Wildlife Federation, Earthjustice, the Florida Oceanographic Society and the Conservancy of Southwest Florida said state officials have known about pollution problems for 30 years, but refuse to stop the problem at its source. They said Governor Scott’s Administration has been allowing polluter lobbyists to write their own loophole-ridden rules that have led to outbreaks. · Ensure planned water storage projects are operation by the next rainy season. · Ensure CEPP, C-43 Reservoir and other critical project authorization in the next Water Resources Development Act. · Regulate septic tanks and upgrade wastewater treatment systems. 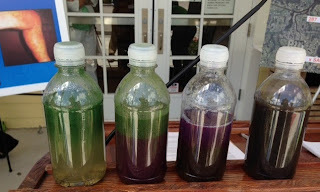 · Regulate agricultural pollution, requiring more on-site storage and treatment. · Fully fund Florida Forever to buy more lands for natural water storage and treatment. · Set measurable enforceable nutrient pollution limits so waters are safe for swimming and fishing. 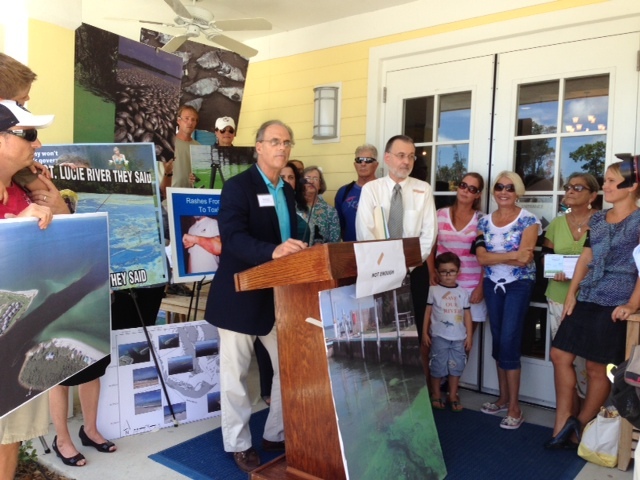 The groups were joined by representatives of the Sanibel Captiva Conservation Foundation, Indian Riverkeeper, Expedition 500, Marine Resources Council, Martin County Conservation Alliance, the Rivers Coalition, Conservation Alliance of Ft. Lucie County and other water quality advocates and local residents. “We know how to prevent this pollution and we need to start doing it,” said Jackalone.